We are well and truly all into the swing of going back to school, and at the end of every august every year everyone goes shopping for stationery! I left mine until just recently as I wanted to know for sure what I was needed to take to sixth form, here are the little goodies I picked up on a trip! The most important things that I needed to get were ring binders, this makes filing and organising your work so much easier to do! 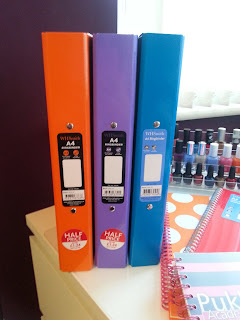 I bought them in different colours so that each subject can have a different file. They were also on offer so that was a bonus! I also bough a mini Pukka Pad that comes with a planner built in, not only is this great to doodle, note things down but you can also add your timetable and important dates in the front. I also like that these pads enable you to move the dividers around and make them where you want them to go. A small jotter to note things down in one of my subjects as I don't need a folder, instead I can just use this when I really need it. 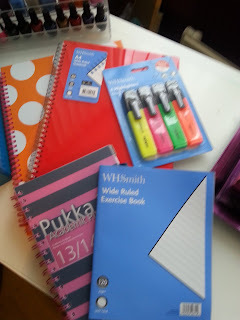 The spotty notepad is my fav,and I was really disappointed to see that they didn't have it in any other colours so instead I had to get the boring red one! Oh well.. I also bought some highlighters as I find them so helpful in my work and revision notes because it tells me the most important things I need to learn.